From researching and selecting the right Keywords, to organizing those Keywords into Well-Organized Campaigns and Ad Groups, to setting up PPC Landing Pages that are optimized for conversions. Search Engines reward advertisers who can create relevant, intelligently targeted Pay-Per-Click Campaigns by charging them less for ad clicks. If your ads and Landing Pages are useful and satisfying to users, Google charges you less per click, leading to higher profits for your business. 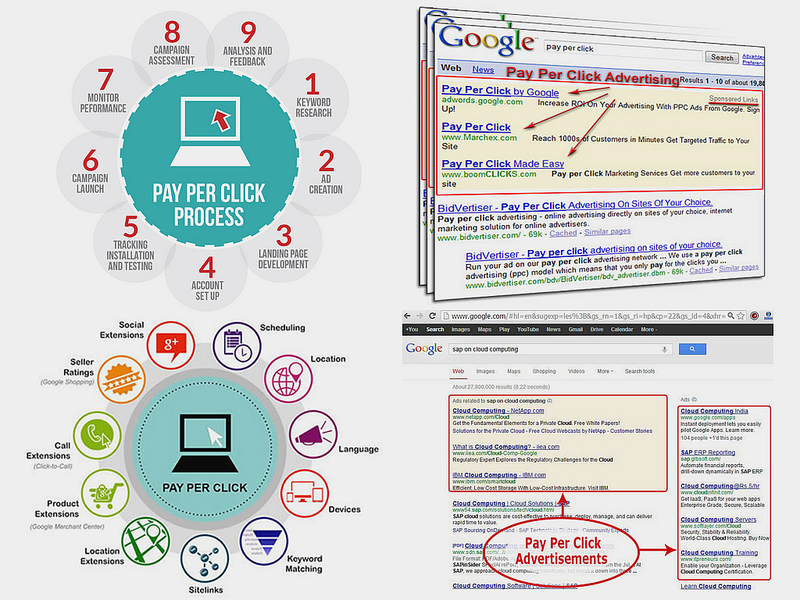 So if you want to start using PPC, it’s important to learn how to do it right. More specifically, who gets to appear on the page is based on and Advertiser’s Ad Rank, a metric calculated by multiplying two key factors – CPC Bid (the highest amount an advertiser is willing to spend) and Quality Score (a value that takes into account your Click-Through Rate, Relevance, and Landing PageQuality). This system allows winning advertisers to reach potential customers at a cost that fits their budget. It’s essentially a kind of Auction. The below infographic illustrates how this Auction System works. Keyword Relevance – Crafting relevant PPC KeywordLists, tight Keyword Groups, and proper Ad Text. Keyword research for PPC can be incredibly time-consuming, but it is also incredibly important. Your entire PPC Campaign is built around Keywords, and the most successful AdWords Advertisers continuously grow and refine their PPC Keyword List. If you only do Keyword Research once, when you create your first campaign, you are probably missing out on hundreds of thousands of Valuable, Long-Tail, Low-Cost and Highly RelevantKeywords that could be driving Traffic to your site. Relevant –You want to find Targeted Keywords that will lead to a higher PPCClick-through rate, effective Cost PerClick, and increased profits. That means the Keywords you bid on should be closely related to the offerings you sell. K3 Web Creationis a premier Pay Per Click Management Company in Mumbai, India known for its dedicated professionals and extensive industry experience. Delivering high ROI through constant monitoring, testing and better targeting of Keywords, we are preferred by businesses from around the world to manage their PPC Campaigns. No matter what your budget is and whether you have short term or long term goals, we can manage your Campaign so that you get the Maximum Returns on Investment.